PAC Behind GOP Candidate For Gabby Giffords Seat Shows Gun In Email Appeal : It's All Politics Former Marine Jesse Kelly, who ran against Gabrielle Giffords, has avoided such images in his campaign to fill her seat in an upcoming special election. A PAC supporting Jesse Kelly, a former Marine running to replace Rep. Gabrielle Giffords in a special election on Tuesday, is using an image Kelly's campaign has avoided thus far — the candidate holding a gun. Kelly, a Republican, ran against Giffords, a Democrat, in 2010. Giffords resigned in January, just over a year after a shooting spree left six dead and the congresswoman critically wounded. Kelly's opponent this time is former Giffords aide Ron Barber, who was shot twice during the 2011 rampage. Giffords will appear at a fundraiser for Barber on Saturday, prompting the Move America Forward Freedom PAC to put out a call for donations on Thursday morning. The PAC supports former members of the military who are seeking office. 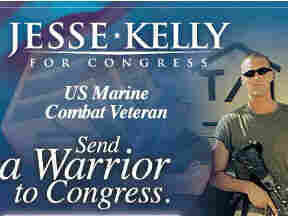 They included an image from Kelly's 2010 campaign in which he is holding an assault rifle, along with the phrase "Send a warrior to Congress." The 2010 race was particularly nasty and has reemerged previously in this campaign. The House Majority PAC, which supports Democratic congressional candidates, recently released an ad showing Kelly during the 2010 race, saying Giffords was a "hero of nothing." It was criticized for a lack of context. Kelly has changed his tone from 2010. His current ads feature him as a family man, promising to protect his grandfather's social security. As for his service in the Marines? Kelly says that taught him teamwork. The Move America Forward Freedom PAC's message is that Giffords should not be a factor in the race to fill her seat. Their email to supporters said, "While we applaud the former Congresswoman's recovery, this race is not about Gabby Giffords. We want to give the people of Arizona a new voice that reflects their values." In a statement to NPR, Kelly campaign spokesman John Ellinwood said, "This campaign is about bringing jobs and prosperity back to America. That's why we're focused on lowering taxes, growing the economy, and lowering gas prices using American energy."